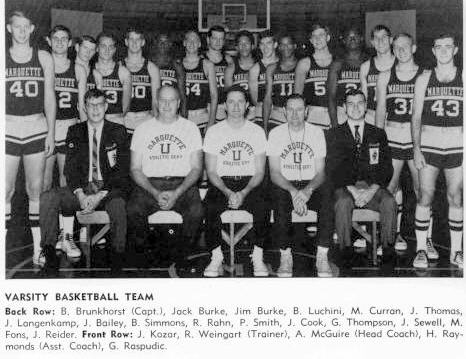 Al McGuire imprinted his personality on the Marquette basketball team in 1967-68, and the results were impressive. The Warriors, heady, scrapping, and shining with desire like their coach, fought to a 23-6 record and a third place finish in the National Collegiate Athletic Association Mideast Regional in Lexington, Kentucky. The number of wins was exceeded only once in Marquette history and, coupled with last season's 21-9 record, gave the school its first back to back 20-win seasons in history. In the process, the Warriors broke a season record for field goal percentage and a single game record in the same category. They were also 12th in the nation in scoring defense, allowing opponents 64.7 points per game. Junior forward George Thompson, rapidly becoming the greatest player in Marquette history, smashed five individual records and tied another. The records: most points in one season - 664; best scoring average in one season - 22.8; most field goals in one season - 252; most free throws in one season - 160; and most points in two Varsity seasons - 1,187. Thompson's 16 field goals against Xavier at Cincinnati tied the record held by three other players. The burly forward was named the Most Outstanding Player in the Milwaukee Classic, in which the Warriors finished second, and along with Jim Burke, was named to the all-tournament team. Elvin Hayes put on a scoring clinic at the Rainbow Classic in Honolulu, finishing with 45 points on 22 of 35 shooting. His field goals made and points scored are both single-game records for a Marquette opponent and helped lift the second-ranked Houston Cougars to a 77-65 victory. Marquette came back to knock off Northwestern the following day and finish third in the Rainbow Classic. McGuire's team broke the Arena home attendance record for the third straight year, drawing 157,817 fans in 15 home games. The Warriors finished number ten in the United Press International wire service poll, only the second time in history that a Marquette team ended up in the top ten. The heights achieved by this team were great.